“Slow but steady harvest progress continues as farmers deal with challenging conditions to bring in their crops including rain, snow and freezing temperatures. Farmers have been able to harvest 91 percent of corn and 97 percent of soybeans, both of which are four days behind average,” Naig said. Ninety-one percent of the State’s corn for grain crop has been harvested, 4 days behind the five-year average. 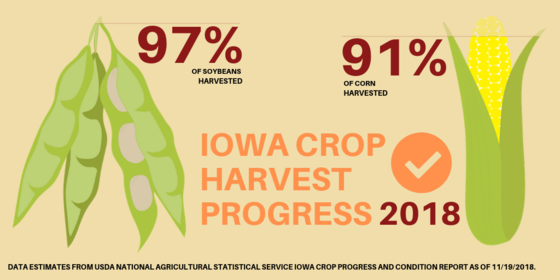 Farmers in northwest and north central Iowa have harvested 96 percent of their corn for grain while farmers in the southwest have 22 percent of their corn for grain remaining to be harvested. Moisture content of field corn being harvested averaged 16 percent. Soybean harvest was 97 percent complete, 5 days behind last year and 4 days behind the average. Iowa experienced an unseasonably cold and dry week during the reporting period. Average temperatures were coldest in eastern Iowa, up to 12 degrees below normal. The state experienced both rain and snow, though some locations in western Iowa reported no measurable accumulations; statewide average precipitation was 0.17 inches, well below the weekly normal of 0.49 inches. Light accumulating snow was reported in Keokuk (Lee County) on Monday (12th) along with colder than normal temperatures statewide. Trace amounts were also reported in central Iowa. A strong high pressure system over the Great Plains dominated the weather pattern for much of mid-week. Tuesday (13th) and Wednesday (14th) were dry statewide with average highs reaching the upper 40s across parts of northwestern Iowa. A southerly wind helped temperatures warm into the upper 40s to middle 50s on Thursday (15th). Northwestern Iowa had daytime highs 10 degrees above average. Snow moved into Iowa during the afternoon on Friday (16th) and lingered across the state into Saturday (17th). Snowfall totals were over three inches in Iowa’s northeastern third. St. Ansgar (Mitchell County) observed 3.8 inches of snow. Snow showers reformed across Iowa’s southern half later in the day on Saturday before moving out early Sunday (18th). Accumulations ranged from a dusting to over six inches; Beaconsfield (Ringgold County) reported 6.5 inches. Bitter cold temperatures gripped northern Iowa to end the week. Some locations had overnight lows below zero Saturday night into Sunday. Mason City (Marshall County) reported a low of -6 degrees, breaking the record of -4 degrees set in 1894. Sioux City Airport (Woodbury County) reported the week’s high temperature of 60 degrees on the 15th, 13 degrees above normal. An overnight low of -6 degrees was reported at New Hampton (Chickasaw County) on the 18th, 28 degrees below normal.